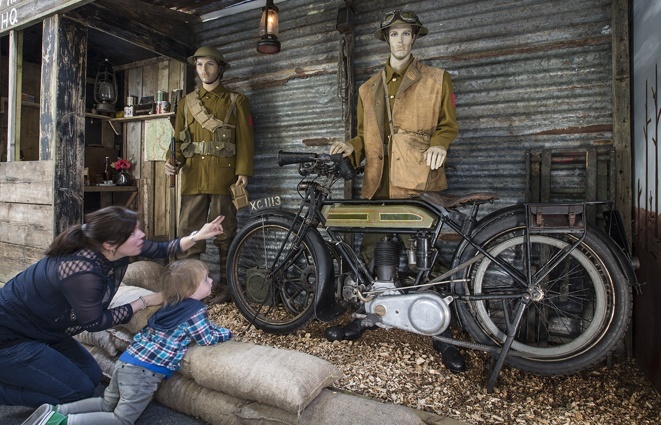 The Lakeland Motor Museum will mark the 100th anniversary of the end of the First World War this weekend, by not only remembering the bravery of the thousands of soldiers who fought in the conflict, but those who worked to treat the wounded. In addition to the long-standing WW1 display on the museum’s upper floor, an ambulance originally used during the war will be on display for one weekend only. Owned by local man Ken Atkinson – who also appeared with the museum’s team in a recent episode of TV’s ‘Walking Britain’s Lost Railways’, the Rhodia vehicle will be put on display for visitors on Saturday 10 and Sunday 11 November. 70 million people fought in the war on all sides, with more than half suffering injuries as a direct result of the conflict. More than 8.5 million served in the British Armed Services, resulting in more than 1.5 million injuries and nearly one million fatalities. Visitors to the museum this weekend will also be invited to donate to the Royal British Legion’s poppy appeal – almost £10,000 has been raised at the museum in the last four and a half years. 14 men from the Haverthwaite parish - where the Lakeland Motor Museum stands, were either killed in action during WW1 - or passed away later due to injuries sustained in battle. Each is remembered in the museum’s special display exhibit. You can donate online to The Royal British Legion's Poppy Appeal here. If you are visiting us on Sunday, please note we will be observing the 2-minute silence on Sunday at 11am.